As I take my customary bicycle ride through the Neighborhood of the Arts, I often see the gathering, there and also at the Memorial Day Parade. 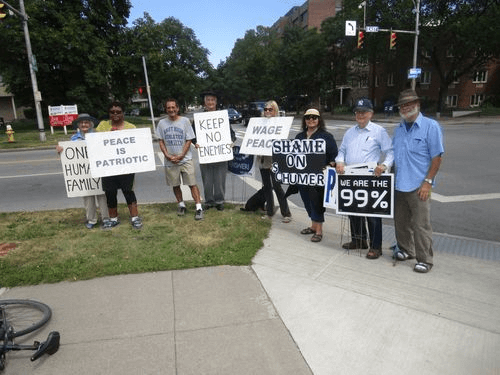 This Sunday, I finally stopped to learn more about these peace activists and their long vigil, ongoing for more than 10 years every Sunday from noon to 1pm. 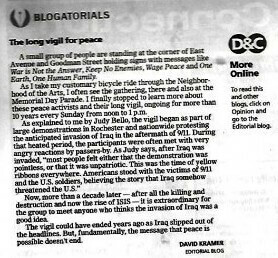 Now, more than a decade later – after all the killing and destruction and now the rise of ISIS – it is extraordinary for the group to meet anyone who thinks the invasion of Iraq was a good idea. After ten years, many people who come through the neighborhood know and expect the hardy vigil every Sunday. They honk and wave, send a “thumbs up’ or hold up their fingers in a peace sign. Occasionally, someone will call an insult or express anger, but this is rare. Walkers stop to chat and pet the peace pug. Supporters bring hot coffee in the winter. Bicyclists, like myself, and even people in wheelchairs come through to chat for a moment before rolling on. More so, when a crisis arises, more people join the vigil. This week support for the nuclear deal with Iran was paramount, the group had a timely message for Senator Schumer. Yes, there are only a handful left on the corner these days. But, as Judy so eloquently says: But our presence is a seed, Most people want to avoid war and pursue peace. That’s the message that needs to back to those in power. We are surrounded by a silent majority of peace lovers. They are not alone on the corner of East and Goodman. 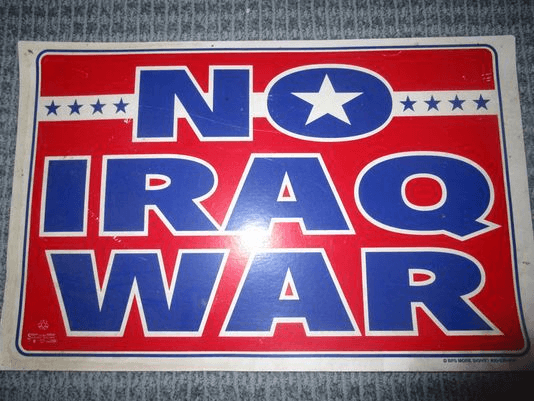 Note: To prepare this post, I retrieved a battered No Iraq War sign kept by my mother in her garage. 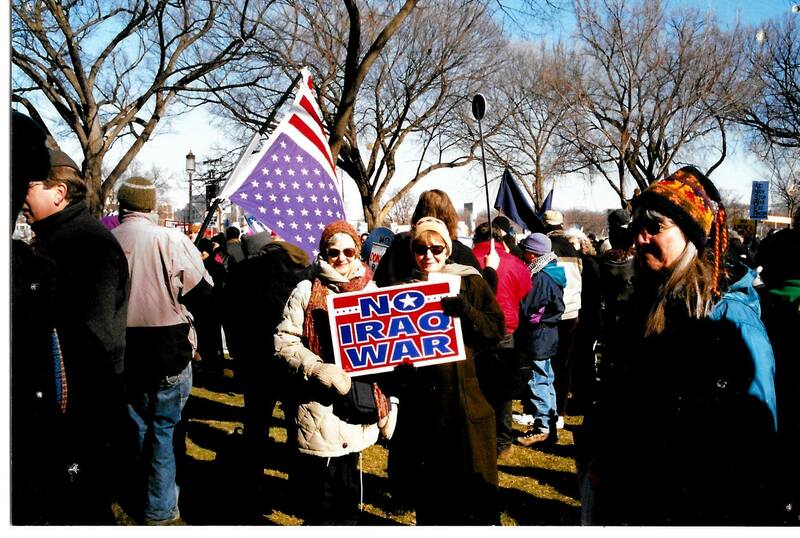 I was proud to remember when she and her friends held that sign more than ten years ago, twice at protest marches in Washington and once in New York. For more on vigil, see first episode of the ‘Hank Funnies’ here.